Hereafter is a movie masterfully directed by Clint Eastwood. Starring Matt Damon, who gave a superb acting as a Psychic. I like this movie, though I used up half of the facial tissue from crying so hard. I remembered my Mother and all the departed friends and relatives. I also remembered my twin Godchildren, Joshua and Jonathan. Joshua died of the same vehicular accident, same with that of the twin character in the movie. 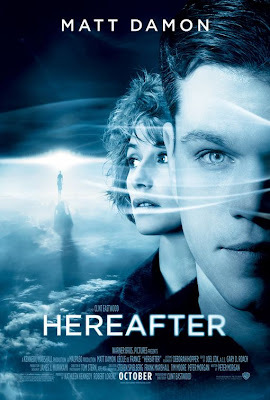 Synopsis: Hereafter tells the story of three people who are touched by death in different ways. George (Damon) had a special connection to the after life since he was a child. Marie (Cecile De France), a French Journalist, has near death experience when a tsunami hit, thus shaking her reality. And Marcus (a London schoolboy), loses his twin brother, he desperately needs answers. Their lives will intersect. hello Ms.Joy..how sad po..my aunt also dies of a vehicular accident po..*hugs*..looks like it is a must see movie..ok Ms.Joy I will watch pero dala ako madaming tissue..madali pa naman akong umiyak po.. I saw this movie right after the earthquake and Tsunami in Japan. I felt so sad. I love Matt Damon, he's very versatile. Who doesn't like movies? Have you watched the last Harry Potter movie yet? Let us know what you think of this popular movie. I'm due to watch next week. Murderers, rapists, plunderers, people who violate peace, people who destroy palestinian's homes....What will happen to them... What does Torah say about punishment in hereafter, hell, reckoning.... ? I watched it but I was not able to finish it,but one thing is sure, we all gonna die we just don't know when and how. So we must live to the fullest and make things better for ourselves and for others while still here on earth.